Hello friends from Modern Glam!!! Wasn’t that breakfast in bed basket so cute?!! I love that idea! But the recipe to go along with it? Genius! I bet you’re just now thinking about Mother’s Day and you are SO happy to have found this post! I don’t know about you but I am a last minute person for sure. When it comes to Mother’s Day Gifts ( or any gifts for that matter) I’m almost alway behind. I THINK about the gifts well in advanced, but the actually buying and purchasing of the gifts usually comes at a much later date. haha! If you’re reading right now, great you are ahead of the game! If you’re reading this the Saturday BEFORE Mother’s Day, have no fear! 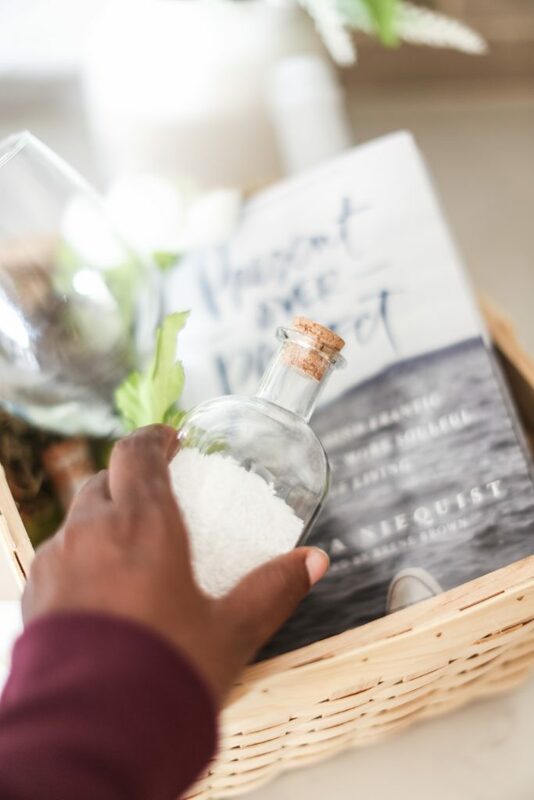 A group of some of my blogging friends and I have you covered with some gorgeous Mother’s Day gift ideas in the form of baskets. I mean who doesn’t love a basket full of goodies?! Check them all out below! Here is a little insight on mine with some affiliate links so you can find any items you need! To start you can get all the basket from Michaels! This is just the book all mothers need. 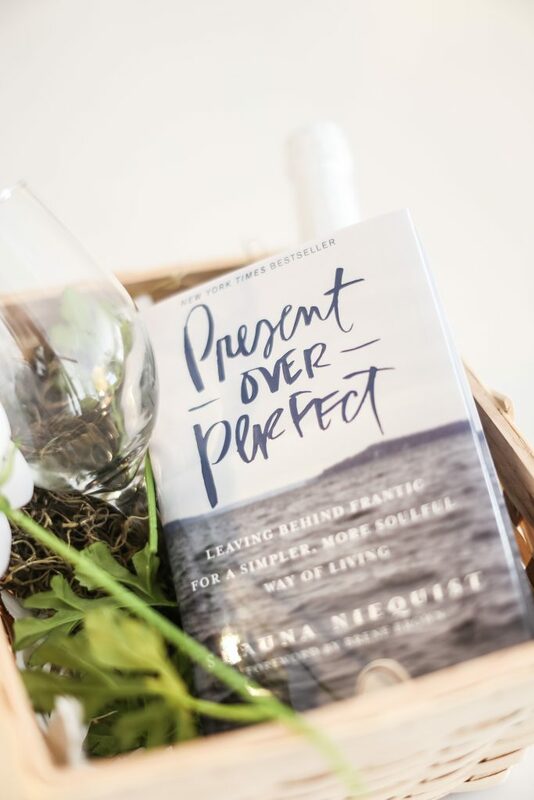 Present Over Perfect challenges women to live a life full of grace , space and connection and reject the feeling of being to messy and imperfect. 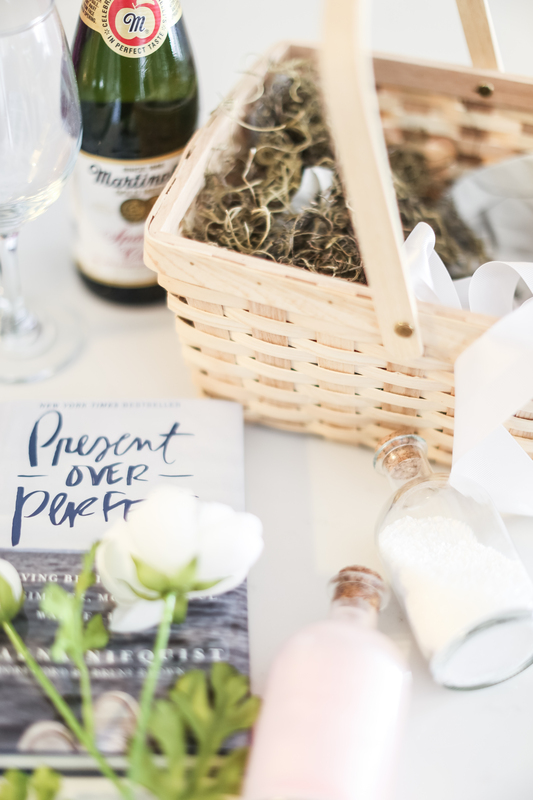 It’s such a great book for mothers to remind themselves that life is about so much more than the business of it all. When you feel overwhelmed remember to live a rich , engaged and loving life despite the circumstances you find yourself in! Shauna Niequist does such a good jobs sharing stories in short little essays so they are easy to digest! So this is definitely a great book from moms! 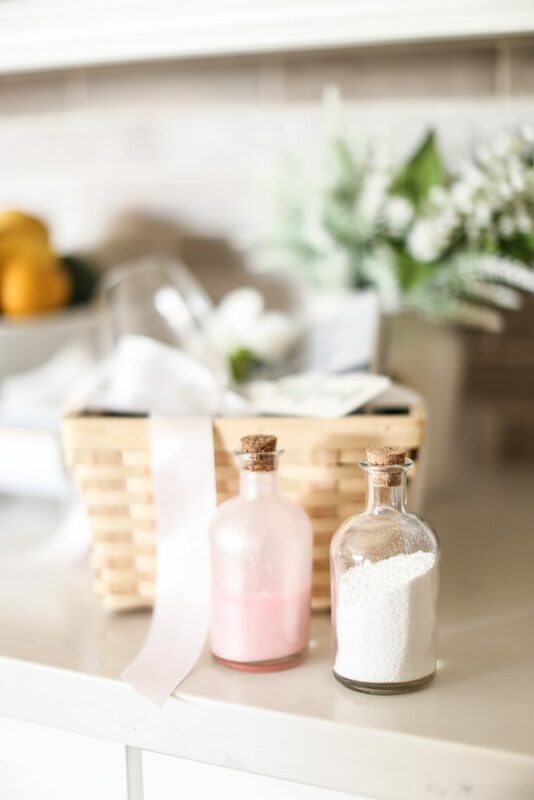 Another great gift to slip into this basket is a bubble bath and bath salts if your favorite mom loves a good bath like I do then they will love the extra touch of homemade bubble bath and salts. I used a simple recipe ( that I will share) and put them in the corked jars I found at Michaels! If you are pressed for time this one can be at your doorstep tomorrow! 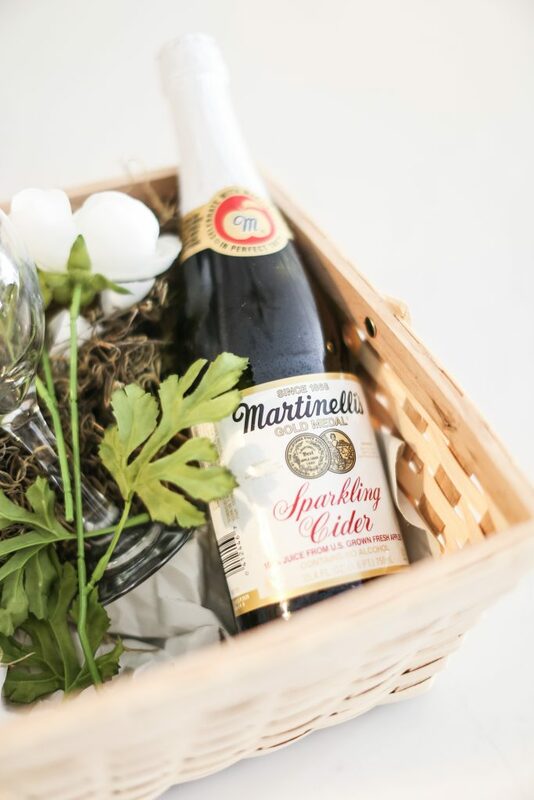 Along with a wine glass, gift your mom a favorite wine or sparkling cider. I don’t drink so am ALWAYS down for some non-alcoholic fancy beverages! Otherwise, I don’t get to use all those pretty wine glasses! ha! Nestle it in the basket in the back corner so you have just enough room for the book and other items. Wrap everything up in a sweet satin ribbon and you are all set for a perfect Mother’s Day gift basket! 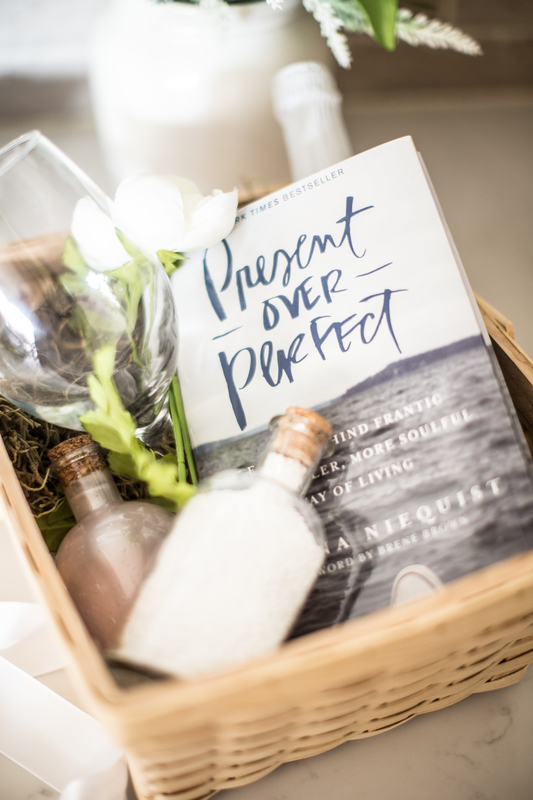 What would you add to your Me Time basket? Check out more of my favorites…. 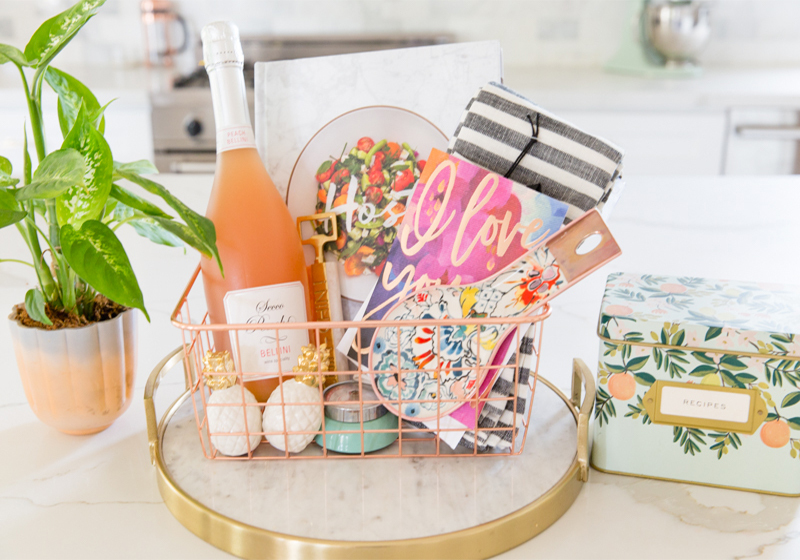 Next, head over to Bethany at The Posh Home to check out her fun and colorful gift basket for the mom who loves to cook! Don’t forget to check out all my friends! You are going to love what they came up with! 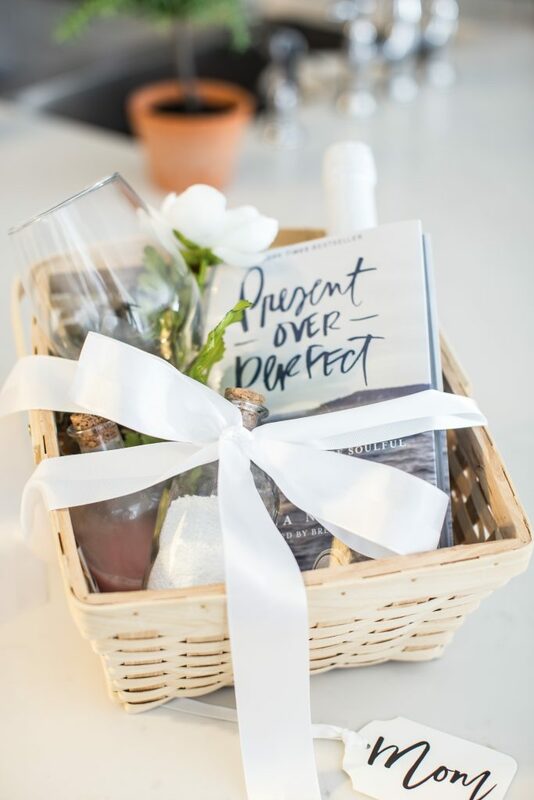 This is a fabulous gift basket! This book is a great must read! I love that you are giving something homemade too. Beautiful!!! Love your basket ideas Destiny and I have been hearing so much about that book that I need to get it. 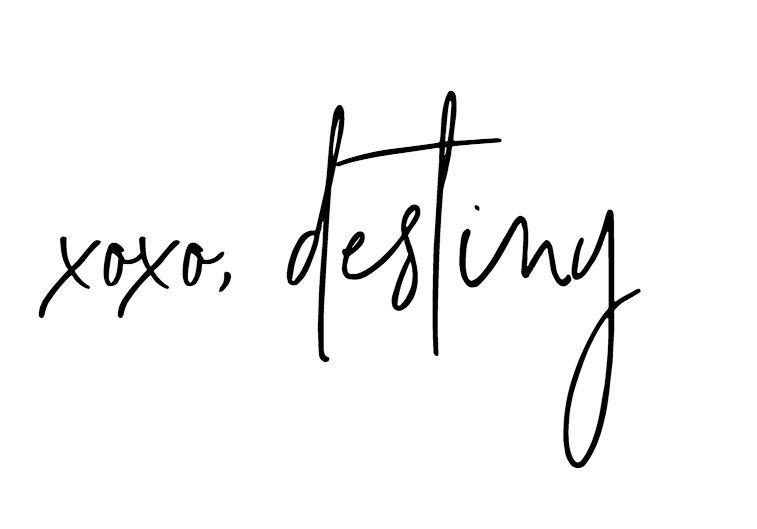 Fun blog hopping with you today!